Fire Call – On July 16, 2016 at 9:07am, Officer Bruno and Officer Apel, responded to a report of an odor of gas at the Mayo Park Recreation building on Bayside Avenue. The Beachwood Fire Department respond and checked the building and found no issues at the building. Theft – On July 16, 2016 at 11:54am, Officer Bruno responded to a residence on the 100 block of Beachwood Boulevard for a theft report. Upon the officers arrival, the victim reported that a 7 inch electronic tablet was missing and believed stolen sometime between July 04 and July 16. Detective Allen Magory is assigned the follow up. Motor Vehicle Accident – On July 17, 2016 at 10:27am, Patrolman Dennis Allen and Patrolman Justin Apel responded to a motor vehicle accident on Rt. 9 and Surf Avenue involving two vehicles. Fire Call – On July 17, 2016 at 10:57pm, officers were dispatched to a residence on the 600 block of Ensign Avenue for possible open fire pit in the rear yard. The Beachwood Fire Department also responded and found that there was no fire. Warrant Arrest – On July 19, 2016 at 9:07am, Patrolman Dennis Allen arrested Sean Friedman, 42 of Beachwood on an outstanding warrant. The arrest occurred in the area of Beachwood Boulevard and Central Way. 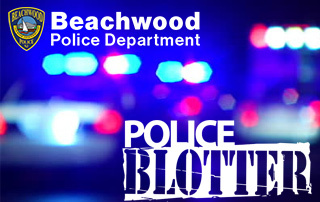 The subject was transported to Beachwood Police Headquarters for processing. Motor Vehicle Accident – On July 20, 2016 at 8:03am, Patrolman Dennis Allen and Sgt. Frank Melillo responded to a motor vehicle accident on Atlantic City Boulevard and Lookout Street involving two vehicles. Motor Vehicle Accident – On July 21, 2016 at 7:58am, Patrolman Justin Apel and Patrolman Sean Langan responded to a motor vehicle accident on the corner of Beachwood Boulevard and Birch Street involving two vehicles. Warrant Arrest – On July 21, 2016 at 3:07pm, Patrolman Justin Apel arrested a 27 year old female, Ashlie Davis of Beachwood on an outstanding warrant out of Tinton Falls. The arrest occurred in the Rite Aid parking lot. Theft – On July 22, 2016 at 8:37am, Patrolman Justin Apel responded to an address on the 100 block of Beachwood Blvd. for a theft report. Upon his arrival the victim stated that sometime during the overnight hours an LG style cell phone and various make up items were stolen from her purse after having friends over during the night. Warrant Arrest – On July 24, 2016 at 12:31am, Patrolman Kyle Carlisle was dispatched to the 300 block of Anchor Avenue for a suspicious male subject. Upon arrival, officers located a Christopher Carter, 40 of Jackson and upon checking they learned the subject had an outstanding warrant out of Ocean County in the amount of $140,347.80. The subject was placed under arrest and transported to the Ocean County Jail. Motor Vehicle Accident – On July 25, 2016 at 8:22am, Patrolman Dennis Allen and Patrolman Justin Apel responded to the intersection of Route 9 and Ocean Avenue for a motor vehicle accident involving two vehicles. Criminal Mischief – On July 27, 2016 at 10:47am, Patrolman Sean Langan was dispatched to a residence on the 400 block of Ocean Avenue. The resident reported that flowers located around the mailbox at the residence were damaged. Motor Vehicle Accident – On July 28, 2016 at 4:14pm, Patrolman David Bowden responded to Atlantic City Boulevard and Anchor Avenue for a motor vehicle accident involving two vehicles. Assault – On July 28, 2016 at 9:03pm, Beachwood Police Officers Meissner and Bowden were dispatched to the area of Birch and Surf for a fight. Upon the officers arrival, no one was located in the park. Officers were then dispatched to a residence on Spar Avenue for an assault victim. Upon their arrival, officers were met by a 20 year old male who stated that he was assaulted on the corner of Halliard Avenue and Elm Street in the area of Birch and Surf Park. The victim was observed by officers to have a laceration to the right arm and was treated by first aid personnel. The victim only offered limited information to officers and was not cooperative detailing the incident. Information obtained reflects that there was some type of mutual meeting between the victim and suspect at Halliard Ave. and Elm Street which resulted in an altercation between the parties. Officers check the location of the assault and recovered a box cutter type of instrument which may have been used in the assault. The Ocean County Sheriffs Department assisted with collecting the recovered item. The incident is currently under investigation and anyone with information regarding the incident is asked to contact Detective Allen Magory 732-286-6000 ext. 191.